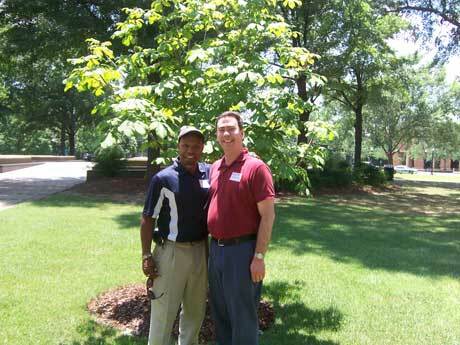 Rabbi Steven Sirbu, right, and Pastor Keni Ashby in front of a tree in Birmingham’s Kelly Ingram Park. The plaque near the tree includes words written by Anne Frank. Rabbi Steven Sirbu returned from Birmingham last week with new insights into social injustice, a mandate for change, and a partner to help him carry out that change. The religious leader of Teaneck’s Temple Emeth – together with Pastor Keni Ashby of the Covenant House of Faith International, also in Teaneck – joined five other “teams” convened by the Jewish Council for Public Affairs to strengthen relationships between the Jewish and African-American communities. Seeking to develop what a JCPA spokesman called “concrete steps blacks and Jews could jointly implement to help alleviate poverty and promote justice in their local communities,” the teams spent four days in Alabama, hosted by the Birmingham Jewish federation. The initiative was part of the JCPA’s anti-poverty initiative, “There Shall Be No Needy Among You,” launched in 2007. Participants needed to apply as teams, said Sirbu, noting that he already knew Ashby through involvement in dialogue programs between Jews and Evangelical Christians. As part of the mission, participants visited sites important to the civil rights movement of the 1960s. These included the Sixteenth Street Baptist Church, where a bomb killed four little girls in 1963. “We had the chance to tour the building, including the pulpit where Martin Luther King and every other civil rights leader spoke at one time or another,” said Sirbu. The group also visited Kelly Ingram Park, a central staging ground for large-scale civil rights demonstrations. A tree was planted there in April in memory of Anne Frank and other victims of the Holocaust. At the Edmund Pettus Bridge in Selma – made famous by the march from Selma to Montgomery in March 1965- Sirbu and Ashby were called upon to offer reflections and lead prayers. “We were impacted in different ways,” he said, pointing out that the civil rights movement “affected both African Americans and the Jews involved” in that struggle. Among other issues, the group discussed access to education as well as inequality in the justice system, “something that really resonated with Keni,” said Sirbu. Sirbu said he intends to explore this issue, looking for ways to partner with others to bring about needed changes. That means, he explained, that a judge can override a jury decision sentencing a person to life imprisonment, changing the punishment to the death penalty. Since judges are elected, he said, “overrides only seem to increase in an election year,” with candidates running on a “law-and-order platform. Tragically, it becomes a campaign tool,” he added, noting that only three states have this kind of override.